By the Romans after they settled on the banks of the River Thames and named the area Londinium (subsequently to become London). Mithra, the Persian god, was much admired by the Roman soldiers, and they spread Mithraism throughout their empire from 68BC to the 3rd Century AD. Temples dedicated to Mithra can be seen in many locations throughout Europe. This particular temple on Queen Victoria Street had been dedicated to Mithras by Ulpius Silvanus, a veteran of the 11 Legio Augusta. Its existence had first been suspected in 1889 when a relief of the god Mithra ritually slaying the bull was found in Walbrook. The area suffered extensive bomb damage during World War II, and Professor W.F. Grimes began excavating the area in 1954. Many of the fine sculptures and a superb silver incense box decorated with scenes in relief are exhibited in the Museum of London. The Temple itself is on Queen Victoria Street. Mithraism (the cult of Mithra) was so popular during the early days of Christianity that the Christian Church could not possibly compete with the pagan celebrations surrounding the birth date of Mithra, and they therefore declared the birthday of Christ to be on the same day - December 25th. Orthodox Christianity believes January 6th to be the birth date of Christ. Persian cats originally came from Persia - Kerman (a region of Iran), to be precise. Noted for their long hair, short, stubby legs and snub noses, these cats reached immense popularity in 19th century Britain. Particularly fashionable in the 19th century was the Persian Blue, a robust cat with blue-grey long fur and beautiful, solid copper-coloured eyes. 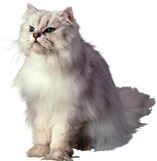 Persian cats are known for their intelligence, demure nature and regal beauty. Because of their short legs, they are not good jumpers and climbers and tend not to roam too much. Their coat is extremely thick with a very dense undercoat that requires a formidable amount of maintenance - at least three hours a day of intense brushing. This high maintenance grooming regime makes the Persian cat an unsuitable pet for those who are not prepared to spend the time to groom them. Copyright Persian Care Centre 2019©. All Rights Reserved.